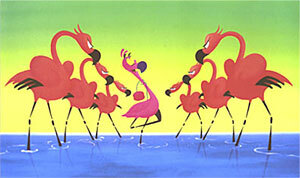 Fantasia 2000 continues the vision of Walt Disney’s Fantasia released in 1940. Disney imagined a film that would evolve over time with new segments replacing old, and new technologies making never-before-seen animation magic. This segment, ‘Carnival Of The Animals’, was inspired by the original ‘Dance Of The Hours’ and developed by Disney’s legendary Joe Grant. The edition recreates the hilarious moment when Punkin’s yo-yo skills are not highly regarded by the ‘Snotty Six’. This beautiful fine art edition conveys the rich color and remarkable detail of the actual screen moment. Each giclee is individually numbered by hand.